VZRscada is now available on COSTARS! Discover how the Hazleton Sewer Authority is saving time and money! VZRscada is a modern solution that integrates hardware, software and communications technologies, in order to control and monitor critical infrastructure and processes. You can seamlessly connect existing control systems to VZRscada. We support your field staff with 24/7 remote emergency access. Program changes and process optimization can be performed remotely, saving time and costs associated with on-site modifications. PLC systems, instrumentation and motor controls can all be connected to our secure support portal. VZRscada can be connected to existing systems from multiple manufacturers, so if you have Allen-Bradley, GE, Siemens or Square-D, you don’t have to replace everything and start over, we can connect it all to VZRscada. Your infrastructure can be connected to our secured network. Treatment plants, pump stations, meter vaults, and generators can all be seamlessly integrated. VZRscada does not require analog phone lines, DSL or cable modems. In fact, VZRscada is designed to replace all that. There are no expensive firewalls to install or maintain. VZRscada provides a comprehensive cyber-secure solution to your telemetry needs. VZRscada is a next-generation event notifier that allows replacement of analog auto dialers. Auto dialers are prone to failure caused by phone line surges and aging hard-wired infrastructure. You can now get mobile SMS alerts – text message alerts with explicit details. Find out exactly what is going on when an event occurs. Monitor wet well levels, chlorine levels and embed instrument values into the messages to let you know the magnitude of an event. Get more information faster and make process decisions in minutes. VZRscada provides a pathway to increased operational excellence. VZRscada provides a new concept in process visualization. Imagine monitoring your entire infrastructure from a standard wall-mounted flat-screen TV. An all solid-state solution that doesn’t require expensive PC hardware prone to hard-drive and power supply failures. Imagine operating your infrastructure over a secure network. VZRscada’s Local Human-Machine Interface does not support internet browsing, game-playing, or video playback. 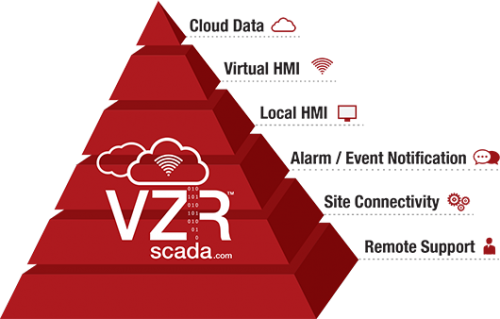 VZRscada does SCADA, and only SCADA, keeping your operators focused on system operations. A wall-mounted wide-screen TV doesn’t use up desk space and is easy to see and interact with. VZRscada takes mobile HMI to the next level. VZRscada connects your main station HMI to mobile tablets over your secure private network. Respond to process alerts in real time; check your infrastructure from the office, while you are at lunch, even from home after-hours or when on call. You save time by keeping an eye on things remotely and having the ability to modify pump settings, valve sequencing, adjust flow rates, speed, pressures and chemical rates from your secure mobile tablet. Say goodbye to the old ways of data collection. Methods that you’ve been using so long you don’t even realize how inefficient they are. Forget clipboards, chart recorders and manual data entry. VZRscada logs your flows, pressures, chlorine, pump amps and more to our cloud based data collection. Prepare reports automatically. Export data to Excel spreadsheets. Log your data to our cloud-based historian and unleash the power of VZRscada.com. You can even set and adjust baselines for leak detection. The internet-enabled cloud database is accessible from any internet-connected device and allows your back office staff to see the process data and simplify your reporting system. Water Plants: Impoundments, towers, tanks, filtration, and chlorination. Water Pump Stations: Drinking water, chlorine levels, well level, pump amps, system pressures, metering and sub-metering. Remote Water Sites: Solar powered, level, pressure, intrusion, rain gauges, flow, temperature, and pH. WWTP Sites: SBR systems, clarification, aeration, UV, chlorination, flows, levels, DO, ORP, pH and pump amps. WW Pump Stations: Wet well level, gas monitoring, flow, pressure, leak detection, intrusion, pump monitoring. Industrial Sites: Secured OEM access for troubleshooting, multi-site connectivity, metering and sub-metering. Commercial Sites: Cooling towers, HVAC systems, generator monitoring, metering and sub-metering, multi-site connectivity and analytics. Civil Sites: AMD, flow monitoring, impoundment level and flow, Flood Control system monitoring. Agricultural Sites: Silo levels, processing, feed management systems, site connectivity and remote monitoring and control of modern AG systems. Our applications team will visit your site and listen to your concerns and challenges. We’ll observe and document your existing system. Our applications and engineering team will present a proposal for your consideration. Our engineering and design team will apply the VZRscada solution to your specific requirements. Our site team will install your system, thoroughly test all functionality, then take it live. Once your system Is live, our team is Available 24/7 for Emergency Trouble Shooting.